I am very sad to pass along the news that one of our sweetest little special needs bunnies,Rupert, has passed away. Rob and I returned home to find him dead. In the past week Rupert had been extremely ill and we were doing everything we could to help him, but he grew progressively weaker and we just didn't want to think about losing him. medications by mouth and injection. He seemed to really understand that we were trying to help and we always made a big fuss over him. Rupert had clearly been neglected, if not actually abused, in some way before he ended up at the San Jose shelter. His leg was mangled. Yet he was one of the sweetest bunnies we've met and Rob and I we loved to be with him. What is so sad is that Rupert was probably only about a year old.He never had the chance to be a really healthy, active bunny. Even though we face death each day with the work we do, it never gets easier. Losing one of these special little souls feels like losing a best friend and member of the family. We really loved Rupert and will greatly miss him. Hi. My name is Rupert. I am a small, elegant,gentle and sweet mini-rex boy. 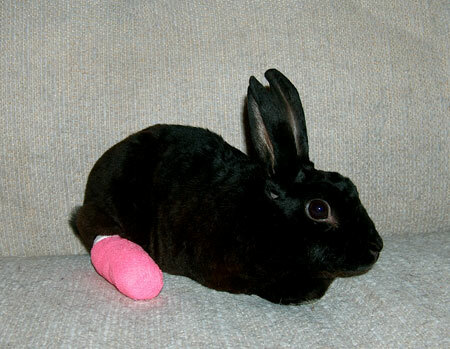 I came to SaveABunny because I have a badly broken back foot that is also being treated for an abscess. We are doing everything we can medically to try to save my leg, but it may be too far gone and need to be amputated. Regardless of what happens to me, I finally feel safe and loved. It was obvious to the animal shelter staff who first cared for me and the volunteers at SaveABunny, that I had been very neglected. Yet, even though my humans had not given me the love and attention I wanted or deserved, I am still an incredibly trusting and loving boy. So, for right now I am not available for adoption until my leg is either healed or amputated. My medical expenses are already about $850 dollars and will about $1000 more if my leg needs to be amputated. So, if you would like to help me by making a donation to help pay for my medical expenses, it would really help me and also allow SaveABunny to help other rabbits in need. Thank you so much for caring about me and please check back soon on my progress!